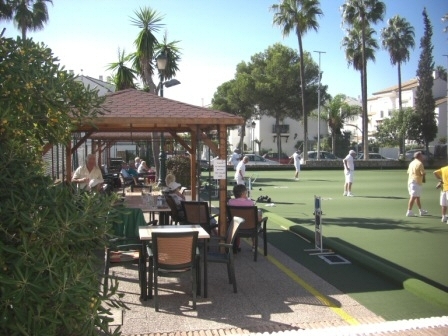 Benavista Bowls Club is just 15 minutes drive from fashionable Marbella & 5 minutes from San Pedro de Alcantara, a popular Andalucian style town. 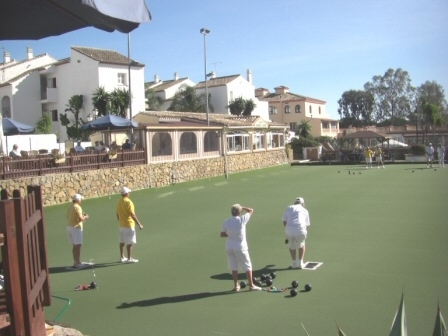 Benavista Bowls Club situated in Benavista in the Estepona Area. Please contact Club Manager, Peter Stroud, for more information. Our club is situated in benavista in the Estepona Area. We have a club house which is open to the public 7 days a week for meals and drinks. We have about 90 members, about two thirds return to the U.K. for the summer. We have six rinks for the use of real bowlers, and two rinks available for use by the general public. Membership fees are €17 per annum. Different levels of Playing fees are avaiable please enquire at the club. 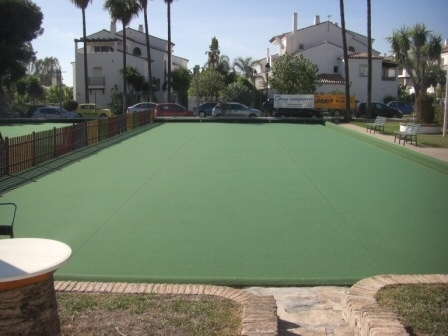 Benavista Bowls Club is just 15 minutes drive from fashionable Marbella & 5 minutes from San Pedro de Alcantara, a popular Andalucian style town. Restaurants, bars, shops and nightlife abound in the vicinity, plus ample rented accommodation. This makes it a popular club with visiting bowlers, as everything you need is in easy walking distance. The club, noted for its friendly atmosphere, is set in an idyllic location, with mountains in the background and bounded by lush palm trees. The beach is 5 minutes walk away. East-West: Follow the directions for Superbowl BC until you reach Corte Ingles department store. Travel to the centre of San Pedro on the N340 3.3 KM. Continue on the N340 1KM to the famous Marbella Arch. Pass the Benahavis turn off on you right. West-East: Travelling on the N340 from Estepona in the direction of San Pedro, you will pass Benavista BC on your left at KM 167. About 1 KM take the Benhavis exit. Pass under the tunnel and take get back on to the N340 in the Estepona direction. Pass the Diana Commercial Centre exit. Take the next exit, (3 KM from the Marbella Arch). Continue on the service road, passing the Mustang Commercial Centre on your right. Continue on the service road until you reach the Benavista Commercial Centre. Benavista BC is located at the end of the Commercial Centre, by a pedestrian bridge. We also have 2 practice rinks which are open to the general public and bowlers.